We carry Elenbaas livestock grains, Pfau rabbit feed, Land O'Lakes livestock grains, Mazuri Llama and Mini-Pig feed, a variety of brands of pet food, waterers, feeders, and other miscellaneous supplies for dogs, cats, chickens, ducks, turkeys, sheep, goats, cows, horses and pigs. Also canning and gardening supplies. In the spring we have baby chicks, ducks, and turkeys. We price match our competitors Coastal and Skagit Farmers Supply for like products. 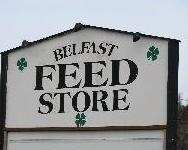 Belfast Feed Store is a local, family owned feed store established in 2006. You can reach us by phone at 360-724-3075 or email belfastfeedstore@hotmail.com. We are located at 6200 North Green Road, Burlington, Washington. Driving directions from Burlington: head north on Burlington Boulevard, it will change names to Old Highway 99 North, after going approximately 3-1/2 miles from Burlington you will see our sign on the west side of the road - also look for the little red barn. Driving directions from I-5: take exit 236, Bow Hill Road, once off the freeway head east on Bow Hill Road, go past the casino, at the base of the hill turn right on Old Highway 99 North. At the next road on the right turn, your at Green Road. Thank you for visiting our website. We want to give you the opportunity to stay in touch with Belfast and our offers. If you are not familiar with our company and have questions please let us know what your needs and questions are we will be more than happy to help. We would be pleased to hear from you!